Art collector, gallery owner and founder of the global advertising agency, Charles Saatchi is famously publicity – shy, a reluctant interviewee who never attends his own gallery openings, or anyone else’s for the matter. This book brings together his unflinching responses to questions he has been set over the last few years by journalists, critics and members of the public. 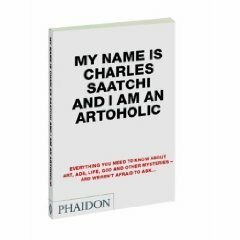 Whether the questions are related to art, advertising, money or his personal life, Saatchi answers them all with disarming and sometimes brutal frankness, creating an enlightening and entertaining first-hand account of the most influential art collector of our time. Q: Looking ahead, in 100 years’ time, how do you think British art of the early 21st century will be regarded? Who are the great artists who will pass the test of time? A: General art books dated 2105 will be as brutal about editing the late 20th century as they are about almost all other centuries. Every artist other than Jackson Pollock, Andy Warhol, Donald Judd and Damien Hirst will be a footnote. Q: Do you wash your hands after has a wee? A: I have an acute sense of hygiene so I wash my hands before I have a wee. Q: If you were commissioning your own portrait, in which medium would you choose to be represented? A: I’d rather eat the canvas than have someone paint me on it. As you can tell from these unusual questions the book is an interesting read. Why should I cater to you Mr. Saatchi when here ‘s my opportunity to speak about my collection. The difference between you and I is how we obtain and value our art collections. Yours is a collection significant for its lack of significant content except the one created by word of mouth. My collection is from thrift stores, artist friends and generally speaking left over behind garbage bins and from the most of amazing locations like open fields and detritus washed ashore or found in salvage yards. The main problem with such art is that there’s no repeat and no provenance to substantiate some fictitiously exaggerated tale. After all, it is the individual’s story that holds the key to heaven. So you made the right decision to eat your caviar (I hope) smeared canvas.